The trickery between Laban and Jacob continued. When Jacob wanted to leave, Laban pressured him to stay, not for Jacob's benefit but for his own. He recognized that God's blessing on Jacob was seeping into his life as well. Yet he seemed forever suspicious that what Jacob was actually doing was stealing from him. So Jacob suggested a foolproof way to determine his wages. His pay would be the less desirable sheep and goats of the flock—the speckled and spotted sheep and goats, and the brown lambs. Laban agreed to this, after which he immediately removed all such animals from his current flocks, giving them to his sons. 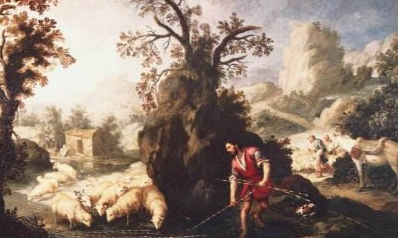 Then he separated his flocks (tended by Jacob) and the flocks of his sons by a three-day-journey distance. "Jacob was not practicing superstition, he was exercising faith which he somehow associated with the rods. God, having designed the laws of genetics, intervened and honored Jacob's faith" R. Russell Bixler, commentary on Genesis, New Spirit-Filled Life Bible, p. 46. "God's blessings are always able to exceed man's defrauding" - Ibid. How encouraging this story can be to us. Even when events, circumstances, and people are arrayed against us, nothing can or will stop God's purposes as He determines (with our cooperation of course) to enact them through us. PRAYER: Dear God, help me to look to You and not circumstances, people or my own wits for success in the assignments You give me. Amen.